What is the Best Web platform for SEO? It is very important to select the website platform that you are comfortable in using as it can be a tedious process if you opt for a platform that you have little or no knowledge about. We have seen many clients using platforms that they have no know-how about and end up paying a lot to their development companies for small changes that they can probably manage themselves. If you haven’t heard about this, then perhaps you have been living in the Stone Age. This is the most widely used platform of all platforms. Millions use this daily for their blogs. It began as blogging platform but has evolved over the recent years to a full-fledged CMS. It comes with countless of themes and plugins to implement into your site, some free and some paid. The old version of WordPress was very poor when it came to SEO but the modern version is very effective as it automatically generates the Meta title and description without even you entering it. The plugins we use for our clients are Yoast and All in One Pack as that will really help in your SEO efforts. This is another fantastic CMS for SEO. It has all the tools that are needed to optimize a website to its full potential. You can implement a whole host of plugins to fine tune your SEO campaign according to your requirements. Just like WordPress, Joomla too is very effective in its default SEO settings as it has the capability to rank a site well. An advantage Joomla offers is that its customization features can educate all the small business owners of the various strategies that they can create for the success of their website. If you’re someone that is looking to try SEO on your own then Joomla is the right platform for you. This platform is very popular with all the news websites or sites that thrive on content. Drupal offers fantastic support when it comes to tagging the entries and their presentation so that the search engines can easily understand them. One drawback of Drupal is that, it can be rather difficult in understanding it if one is not well versed in the coding language, however if you are pro-efficient then you can implement the most effective SEO tactics around. Yes, it is that powerful! All in all, it is a very easy to use CMS platform that comes with an advanced SEO set-up that will enable you to have complete control to add, edit, and delete any content whenever you want to do so. 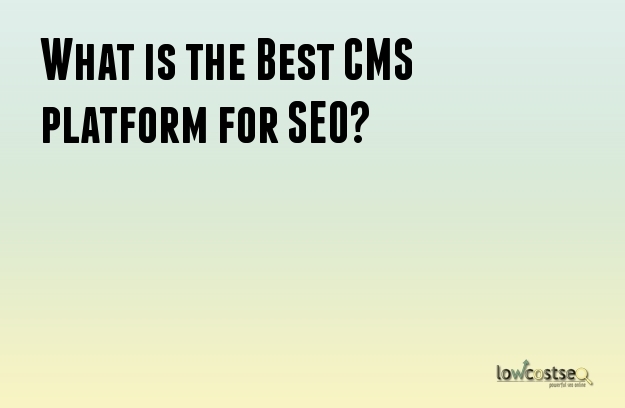 We are curious to hear what is your favourite Web platform for SEO? Contact us to find out which one we recommend to use!